The Rise and Shine discussion group meets Sunday mornings at 9:00 am in the Parlor. Adults from the 8:00 & 10:00 services gather for discussions that are relevant to their lives through the lens of a current topic and scriptural references. This week's discussion outline can be read or downloaded below. Questions: We exist in a society of many traditions, cultures, races, and religions. However, we all share a common humanity. How has the recent news shaken you? How does our shared humanity allow us to lift one another? 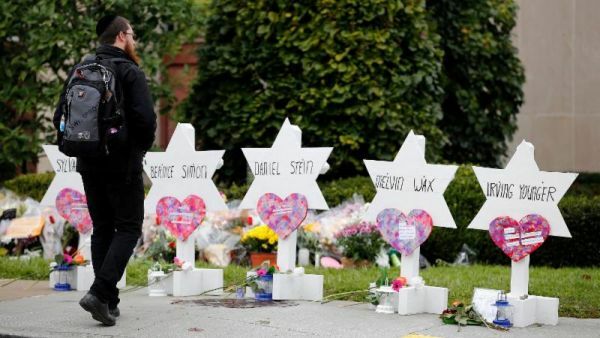 Eleven people were gunned down by a known anti-Semitic man as they were assembled for a Shabbat bris (Sabbath ceremony for a baby boy) at the Tree of Life synagogue in Pittsburgh, Pennsylvania, on Saturday, October 27. The dead ranged in age from 54 to 97. Six others were injured in the attack, including four police officers who responded to the 911 alert. In the ensuing battle, the suspect was wounded and taken into custody. According to investigators, the 56-year-old alleged murderer shouted "All Jews must die!" during the 20-minute rampage. On a social network often associated with white supremacists and extremists, he used slurs for Jews, asserted that the Holocaust was a hoax, and promoted conspiracy theories about Jews destroying the planet, fueling mass migration of "invaders that kill our people," and manipulating the president, whose daughter and son-in-law are Jewish. Shortly before the shooting, he posted online that he couldn't "sit by and watch my people get slaughtered. Screw your optics, I'm going in." On Wednesday, October 24, a 51-year-old armed white man pounded on the locked door of the predominantly black First Baptist Church of Jeffersontown, Kentucky. When he could not gain admittance, he went to a Kroger, where he allegedly shot and killed two African-Americans. The suspect, who is in custody facing multiple charges, reportedly has a long criminal record of domestic violence and a history of making racist slurs and threats. Two days before, the nation was shaken by the discovery of the first of at least 15 pipe bombs sent through the mail to two former presidents, a Jewish billionaire philanthropist, prominent Democratic politicians, and activists who oppose the policies of the current president of the United States. None of the devices detonated and no one was injured, but authorities say the danger they posed was real. The alleged perpetrator of the pipe-bomb attacks, who self-identified as a white supremacist, was arrested last Friday. "There is a growing space in this country for hate speech and hate speech always turns into hate action," Mark Hetfield, president and CEO of the Hebrew Immigrant Aid Society (HIAS), said. "We cannot stand by as individuals or organizations or as governments when people spew hatred against Jews, refugees, Latinos, against any group that some see as 'the other.'" According to the Anti-Defamation League, reports of anti-Semitic incidents in the United States increased 57% between 2016 and 2017. Last Saturday's massacre was the worst attack in history on Jews in America. "As Jews, we know that when one minority is threatened, we are all threatened," said Gavriela Geller, Executive Director, Jewish Community Relations Bureau/American Jewish Committee of Greater Kansas City. "We are stronger when we stand together against hatred and bigotry wherever we see it, and we reaffirm our commitment to supporting our partners and friends from all faiths, races, and nationalities." "What do we do?" asked Rabbi Jeffrey Salkin of Temple Solel in Hollywood, Florida. "We double down. We lean in. We affirm our values. We affirm the centrality of the synagogue in the lives of Jews. "Rather than be afraid of bringing ourselves and our children to synagogue, let us triple our efforts to do so. Maintain your membership in the Jewish community. Your presence is a fist that you shake in the face of the haters." Rabbi Chuck Diamond, a former rabbi of Tree of Life, told a local CBS affiliate: "There's hate in this world, but … we just have to try to be tolerant. Because of the hate, we have to fight hate by doing good things." Dr. Jeff Cohen, a member of Tree of Life, supervised the medical care Allegheny General Hospital provided for the man accused of shooting members of his congregation. Many of the staff who tended to his wounds are also Jewish, Cohen said. "My job isn't to judge him," he added. "My job is to take care of him." There is a Hebrew principle in Judaism known as Tikkun olam, which means "repair of the world." Now is a good time for us all to embrace this principle by acting constructively for the common good, not only for our own benefit. Cain and Abel worshiped God in different ways (vv. 3-5). God accepted Abel's offering, but not Cain's. The elder brother seethed with rage.God warned Cain about the danger of harboring anger against his brother. Rather than deal with his own issues, Cain blamed Abel for what was wrong between himself and God, and his hatred boiled over into violence. Questions: Have you ever felt God holding you responsible for your attitudes and actions? If so, what was that experience like? Jesus’s answer to the authorities trying to trap him wasn't the kind of answer they expected. Instead of condemning a woman accused of adultery to death, his answer forced her accusers to examine their own lives to discover whether they were qualified to pass judgment upon her. Question: What can we learn from Jesus' example that can help us turn away wrath and tone down hate speech? "Jesus does not embody a love, a grace, or a peace that is flimsy, hollow, thin, or cheap," wrote Delonte Gholston, pastor of Peace Fellowship Church in Washington, D.C.. "A Jesus kind of love is messy, reckless, lavish, costly, and foolish to the world. It makes enemies friends and often makes so-called friends enemies in the name of love. The love of Jesus … converts Saul, a killer, into a protector, pastor, and deep lover of those he used to hunt, imprison and kill." Questions: Has your faith led you to develop a friendship with someone you never would have expected to trust, love or respect? What role did your faith play in the development of that friendship?